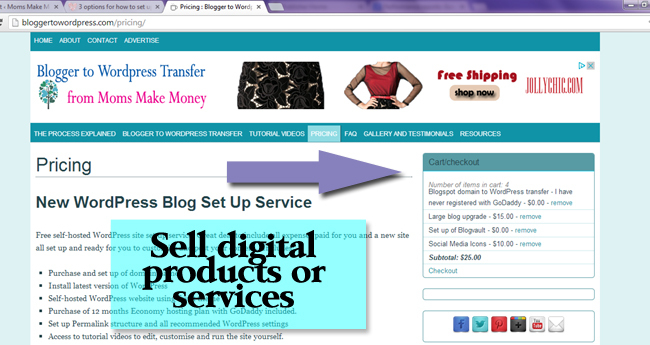 Part 1 in our series on how to set up an online shop is going to deal with the selling of digital products online. I’ve trialed several ways on my own sites and settled on one particular plugin which has worked flawlessly and checked all the boxes for me – and I think it will for you too. In many ways, selling digital patterns is the easiest place to start. There is no stock control, you sell as many as you like – or as many as you can! There is no postage charge to account for, nothing can be lost in the mail, no returns. But you do want a straight forward system that can collect your orders, collect your payment and deliver your goods seamlessly. The ideal system will work while you sleep and deliver the ordered digital goods to your customers immediately so that when you wake, there is nothing to do except check your email to see how many orders you had and rub your hands as you check your ever increasing balance in your PayPal account. Well, that is the theory anyway. How can we make that work without an awful lot of coding and effort? The easier it is to set up the better! That’s a lot to ask for, and an awful lot to expect for free. But I’m happy to say after a lot of trial and error, I found a product which is PERFECT if you want to sell digital products. Easy Digital Downloads is 100% free to download and use and SO simple that it really can be up and running in just a few minutes. Any file that you can upload to your media manager can be accessed and sold via Easy Digital Downloads, payment collected and the links delivered automatically. It really is a passive money making machine – or it can be if you have a great range of digital products to sell! You can see this plugin in action on Blogger to WordPress where I use it to deliver information packs to people who sign up for both my free and paid-for website services. This really only uses a small fraction of the functionality of the plugin. I just use it in a very simple way, but that’s sometimes all you need to do – the simplest way is usually the best way. In this case, I’m not even selling a product. I’m actually selling a service, but I use the system to collect my orders, any payment if appropriate, and then send information packs and documents to my customers automatically and immediately. It saves me SO much work! But I could just as easily be using Easy Digital Downloads to be selling an e-book. In fact, let’s do just that! I’ll set it up and sell an e-book and you can see how easy it is to do for your own WordPress site. 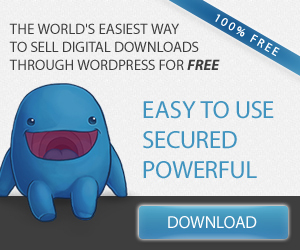 Using Easy Digital Downloads, you could have the plugin installed, set up your first product and be ready for your first sales within 10 minutes. It really is that easy! Of course you would probably want to spend more time going through each of the options more carefully, and once you had some products set up, make a nice products page with all of them on. But that’s not difficult either, and the tutorials included with the plugin will walk you all through how to do it in minutes. They don’t call it EASY Digital Downloads for nothing! Affiliate tracking. Automatically track affiliate referrals and sales and pay commissions. Having an affiliate scheme is a great way to get your products in front of a much wider audience. Currency conversion. So your overseas customers can choose to purchase in their own local currency, or even in BitCoin! Paypal Advanced Payments. So you can accept credit cards directly to your site. Galleries Pro. For creating amazing product galleries. Social Discounts. Offer your customers a discount for sharing products. Points and Rewards. Purchases earn rewards points which can be redeemed as discounts against future purchases. Recurring payments option. For membership and subscriptions. Mailing list integration. Automatically add customers to your email lists. And so so many more add-ons for every conceivable need. Easy Digital Downloads truly will be the best product for you to sell your e-books and other downloadable products online. Coming up next in our series on Setting Up Shop, is the Do It All Store Front system, an Amazon Store and store for all of your affiliate and 3rd-party products. I am using Nrelate – yes, its only for WordPress. I’m very happy with it. You’ll be pleasantly surprised with how easy it is to use. You can be up and running with selling a product within a post, or on a page gallery full of products. Drop us a link when you get something set up so we can take a look at your hard work. Would you please tell me how and where to find the images needed for ebooks, (especially those related to preschoolers)? I’ve created a wonderful early literacy curriculum and find that getting the right images is a challenge. I would really like nursery rhyme and bible images. Thanks for your help! If you are writing your own books, then really you should try to include your own images. Most of the free images you find online are going to come with some restrictions as to how and where they can be used, and you could get in serious trouble if you use an image without the correct permission, potentially sued for a lot of money. You are better off playing it safe under these circumstances and buying images to use with the correct licencing – I use Dreamstime, and you can buy a package with them to cover all the images you might need. Thank you, thank you for this article. 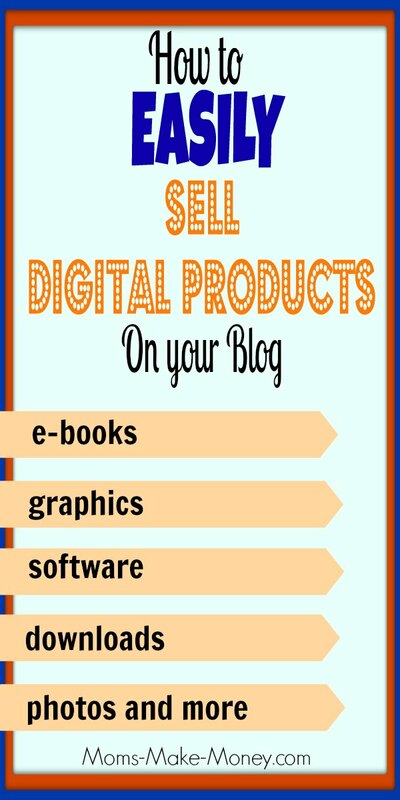 I have been doing some research for selling our digital items on my blog and you have answered a lot of questions. Pinning for future reference. Thanks so much. Thanks for the advice! I need something like this for my new WordPress site. Thanks again, Deby! Something I’ve been wanting to look into, but haven’t been sure where to start. Loving this series! Thanks so much! I was thinking to sell some of my patterns but ..I am not sure have to make patter itself…in pdf.. I use a program called Serif Draw to design my sewing patterns and then its a bit of a complicated process, but I save as a jpg, upload into photoshop and from there I split the jpg into sections and save each one as a PDF page. Then I use PDF SAM to join all the individual PDF pages into a single document. Its a lot of work, takes me hours. But when I started out, I simply hand-drew the patterns onto a large sheet of paper. Then cut them up into smaller pieces and scanned each one and saved as a PDF. Will at least get you started while you learn about how to draw patterns online. Good luck with it Evie – your doll clothes are awesome. More great advice! I’m on the verge of writing an e-book and collecting this type of information – thanks so much for sharing. Easy Digital Downloads will be perfect for selling e-books. Quick and easy to set up and free. Can’t get any better than that! Yes, you can restrict the number of downloads. But of course once someone has a PDF copy of your book on their computer, they can then email it to people as an attachment and that can’t easily be stopped. You could add a password protection but that only offers limited protection. There may be further levels of security you can add, but its not something I’ve ever investigated. I’m so glad you are covering this. I am just starting to work on selling digital products. I will be following this! Thanks for the tips and for sharing it with us! Pinned to the party board. These are great tips! I honestly never thought of doing this. So happy to have found you! Pinned this from Pin It Monday Hop! 🙂 Have a great week! Thank you for the advice! I’m just starting out, so this will definitely come in handy. I’m subscribing and following on Pinterest. Thanks again! Deby – thanks for this useful info. I have been wanting to sell my digital patterns on my website or blog but have not gotten around to figuring it all out yet. This is very helpful. It would be perfect for selling patterns Kimberlee. Good luck with it. Deby, are you still happy with Easy Digital Downloads? I’m in the researching phase of writing and selling an e-book, and wondered if you were still using this or another company? Thanks! Yes, it worked perfectly the whole time I used it Jann. It has a lot of features I never used, but if I were to get into selling the patterns etc from my site, I’d go with this one. Although, I’ve not looked at it for a while – just check on how its dealing with the VAT on digital downloads. I’m sure they’ll have it covered, but just double check. Please Deby i want to sell unique short wisdom quotes and it need not be downloaded so i’ll like it to display on the page for the customer to jot down instantly right after the payment. can this be achieved via easydigitaldownloads? I’m guessing that it could, you would set up the page as the redirect page once the order has gone through – the thank you for your order page, and on there have the quote that you are charging them for. Or include it in the email receipt perhaps. Either way, its a very unique business idea. Have you tested it to see if anyone would pay for something like this? I haven’t really but i know my target customers would pay for it. Please i’ll still contact you should in case i get stuck while trying to set it up. I know this is an old post as I am now in 2017 but EDD has changed and the pages do not set up. I set the pages up but they still do not work and I do not get a shortcode. Is there anything you can suggest?